Are you a good friend? 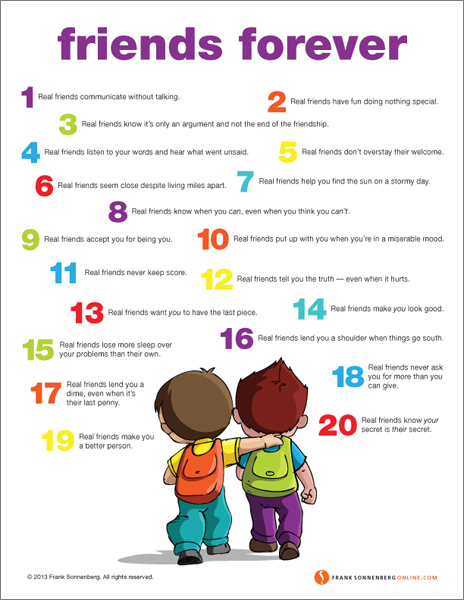 This poster highlights 20 traits of a lasting friendship. 1. Real friends communicate without talking. 2. Real friends have fun doing nothing special. 3. Real friends know it’s only an argument and not the end of the friendship. 4. Real friends listen to your words and hear what went unsaid. 5. Real friends don’t overstay their welcome. 6. Real friends seem close despite living miles apart. 7. Real friends help you find the sun on a stormy day. 8. Real friends know when you can, even when you think you can’t. 9. Real friends accept you for being you. 10. Real friends put up with you when you’re in a miserable mood. 11. Real friends never keep score. 12. Real friends tell you the truth –– even when it hurts. 13. Real friends want you to have the last piece. 14. Real friends make you look good. 15. Real friends lose more sleep over your problems than their own. 16. Real friends lend you a shoulder when things go south. 17. Real friends lend you a dime, even when it’s their last penny. 18. Real friends never ask you for more than you can give. 19. Real friends make you a better person. 20. Real friends know your secret is their secret. Friends are special treasures, they enlarge our world. they make us feel important and not so alone in life. Friends work together, share together, laugh together. Friends help each other out, listen to each other and support each other. The soul hungers for true friendship, someone to associate with, to compare stories with, to go places with, and to call on the phone, or to even to send a short email. Saying Thinking of you! Frank, you have been a true friend and for that I will be forever grateful. You are such a good person and do SO much for others. I’m happy and proud to be among your friends. Thank you for being you. Thank you, Frank. Real friends are few and far between and very precious. I am extraordinarily fortunate to have 3; I treasure them all. You’re right, Judy. Treasure them all.